What type of mop do you use to clean your floors? If you haven’t considered a dust mop, you might want to get one, and I’m going to tell you why. First of all, floors can get really dirty. Imagine you get a swiffer type mop that you get wet right from the get go. Well, they can start to streak dirt and debris after a minute. Of course, you’re going to have to mop with a wet mop, too. What Is A Dust Mop And How Does It Come In Handy? Have you considered using a dust mop? If not, you really need to take a dust mop into consideration. Either way, the dust mop will still give you that advantage, and it will pick up so much with its microfiber material. Then, you can turn around and use the microfiber head of the dust mop as a wet mop or swiffer. That will get the floor completely clean, and then you remove the dust mop head. After you wash and dry the mop head, it’s ready for next time. Hard floors offer a number of advantages over carpeted floors. For one thing, they are far easier to keep clean. The only real downside is that they can be a magnet for dust. Even if you clean frequently, you may wind up with dust bunnies building up in the corners of your room and hiding out under your furniture. One of the easiest ways to eliminate this problem is by using a dust mop. These mops are specially designed to trap and pick up dust, leaving your floors sparkling clean with very little effort. All you have to do is run them around the surface of the floor and they will pick up any dust that they encounter. When it comes to how to choose the best dust mop, there are several different things that you need to think about. First, you should look for a dust mop that has high-quality yarn. Although cotton yarn is popular, it generally doesn’t hold up as well as nylon yarn. However, both types of yarn are good choices for a dust mop. One thing that you should look for is a mop that has looped yarn. In essence, this means that each piece of yarn is formed in a loop rather than just being a loose string. The loops help the mop pick up as much dust as possible. Additionally, they also minimize fraying and reduce the amount of yarn remnants that get left behind when using your mop. The handle of the dust mop should be tall enough for you to comfortably hold without having to stoop or bend. This will help eliminate back pain well you are cleaning the floors. By being able to use the mop in an upright position, you can give your body the support it needs while at the same time reducing tension in your shoulders and back. 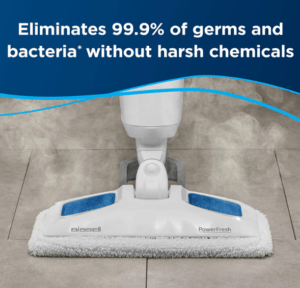 These tips for how to choose the best dust mop should help you select the perfect mop for your home so that you can clean your floors with ease. The dual-action microfiber flip mop is eco-friendly and machine washable up to 100 times. 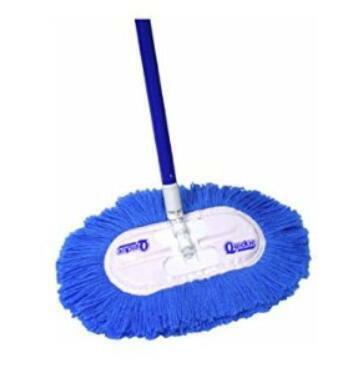 This mop pad works well for all type of dust, such as: cat/dog hair & human hair.